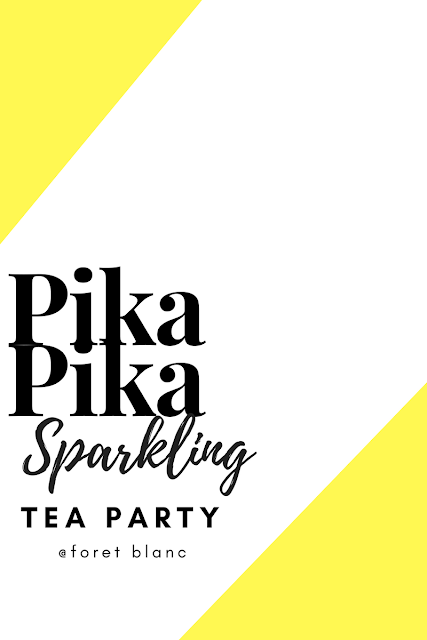 Pika Pika Sparkling Bright Tea Party : Deep Cleansing Is Now Easy! How did you deep cleanse your skin? Is simply by removing your makeup using normal facial wash had completely taken out all the excess makeup from your skin? When we don't deep cleanse our skin, the excess products and impurities could be trapped in our pores. and we all know what happen when the pore is clogged - yap ; acne, pimples, whitehead, blackhead - you name it . These all caused by the clogged pores. So to unclog the pores (is this the right term?) , it is very important for us to always deep cleanse our skin . During recent Pika Pika Sparkling Bright Tea Party , I got the chance to tried their new ranges of deep cleansing product . Now, if you ask me on 'how to deep cleanse our skin?' , I think Pika Pika has the answers . Pika Pika comes from Japanese word that means 'sparkling' . When our skin is clean, surely it will look sparkling , shining , glowing ayte? Now that explains why it is called Pika Pika . There's a lots of activities that me and other Butterflies did during the beauty party workshop . We start with doing the "No mirror challenge" . We're told to do makeup using only waterproof makeup and without looking at the mirror or using phone . What it does? This liquid acts as a makeup remover and also a deep cleanser. This liquid is quite similar to Boscia Makeup Breakup Cool Cleansing Oil , but this one's smells nicer. But the liquid intensity and how the product work is the same. My first impression when i tried using this was that I'm surprised how easily it can remove my waterproof lipstick and foundation . However, I didn't got the chance to fully test it's ability to remove other waterproof makeup like mascara, because I don't wear any on that time . You can read my full review of this Sparkling Bright Fruity Cleansing Liquid on separate post. This gel has the cool menthol sensation after few minutes applying on your skin . When I apply this on my skin , I can feel that it is very soothing, warm and comforting. However, this gel is only to be applied on your T-zone area only, especially nose. Because it can be a little drying if you apply it elsewhere . It helps to control your sebum and also to help removing blackhead and dead skin . It is recommended to use this gel for 1-2 times per weeks for best result. Usage : Apply on T-zone area , gently massage and rinse. Their third product for this deep cleansing range is a peel off mask . Same like the cleansing liquid, this peel off mask also can help to brighten your complexion . Unlike cleansing liquid which containing AHA and BHA, this Sparkling Bright Peel Off Mask contains Arbutin and white clay , which is great for treating freckles and dark spots and also for 'skin detox'. Meaning so, in a single application , this peel off mask can help to revive our dull skin instantly . However, during the party, I didn't try this out on my face but instead, i did apply some on my hand. The texture of this mask is very thick , and it may take quite sometime for it to dry. So, be sure to put only thin layer during application or it will take longer for it to dry. Usage : Apply thin layer on face, let it dry and peel off . I'm gonna get one and try it myself later since I only have the Sparkling Deep Cleansing Liquid and Sparkling Bright Hot and Cool Cleansing Gel . Now, need to add another one - Sparkling Bright Peel Off Mask - and then my deep cleansing squad will be complete . All Pika Pika products are now available in Watsons . Go serbu your nearest Watsons okay? Unicorn ice cream! with chocolates! with edible horn! with edible wings! whatttt? Special thanks to Foret Blanc for our desserts on the tea party the other day ; especially the Unicorn macarons and the Unicorn Ice Cream . It was so good, i'd be sure to come again for more desserts next time . And also special thanks to Watsons x Pika Pika and Mama Butterfly ; Tammy for inviting me and other #butterflies to this party . I really had fun joining this. Muchas gracias! hehe seronok sebab dapat main mekap2 , lepastu makan dessert unicorn. comel sangat! bestnye... Farah main makeup2... produk tu macam menarik jer. Beli beg di Mizzue : Okay Ke Tak? Kualiti Ke Tak?